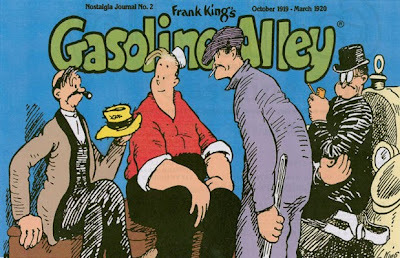 Gasoline Alley is a long-running comic strip created by Frank King and first published on November 24, 1918. Widely recognized as an innovative pioneering strip, Gasoline Alley was the first to depict its characters aging through generations as the decades progressed. There were several radio adaptations. Gasoline Alley during the 1930s starred Bill Idelson as Skeezix with Jean Gillespie as Nina Clock. Jimmy McCallion was Skeezix in the series that ran on NBC from February 17 to April 11, 1941, continuing on the Blue Network from April 28 to May 9 of that same year. The 15-minute series aired weekdays at 5:30pm. Along with Nina (Janice Gilbert), the characters included Skeezix's boss Wumple (Cliff Soubier) and Ling Wee (Junius Matthews), a waiter in a Chinese restaurant. Charles Schenck directed the scripts by Kane Campbell. The syndicated series of 1948-49 featured a cast of Bill Lipton, Mason Adams and Robert Dryden. Sponsored by Autolite, the program used opening theme music by the Polka Dots, a harmonica group. The 15-minute episodes focused on Skeezix running a gas station and garage, the Wallet and Bobble Garage, with his partner, Wilmer Bobble. In New York, this series aired on WOR from July 16, 1948 to January 7.